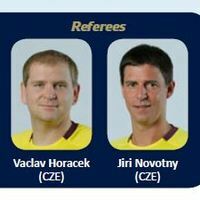 Vaclav Horacek and Jiri Novotny will be the new referees for the World Championship 2015 Play-off between Poland and Germany to be played on 7 June in Gdansk. The new nomination was necessary because Angel Sabroso Ramirez, refereeing partner of Oscar Raluy Lopez, sustained a leg injury that makes it impossible for him to officiate the match. The Spanish pair had been nominated in the first place. Horacek and Novotny were only recently nominated for the semi-final FC Barcelona vs. SG Flensburg-Handewitt at the VELUX EHF FINAL4 last weekend in Cologne. The Czech duo was also nominated for the Men's EHF EURO events in 2012 and 2014.